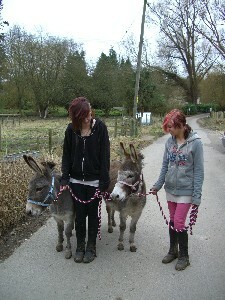 Both donkeys came to us in February 2012 when their previous owner was down-sizing her herd. 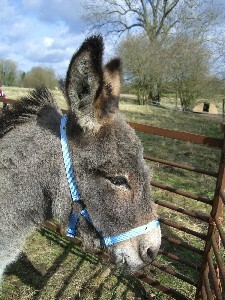 They will be joined by Harvey, a male donkey, at a later date and hopefully we will breed from them. 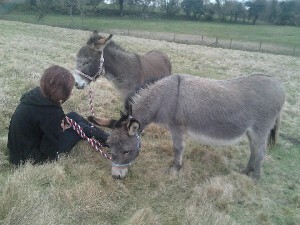 Both donkeys are gentle but can be easily frightened by loud noises. They are fantastic at walking on a lead rope and being loaded onto the trailer. We also have Cleo's son, Sebastian born 8th June 2013 and Maggie's son, Timothy born 31st May 2014. 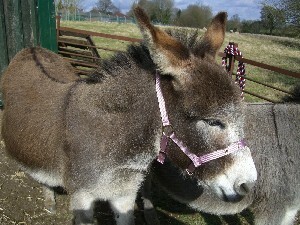 The Miniature Mediterranean Donkey is a unique and entirely separate breed of donkey originating from the islands of Sardinia and Sicily. Because they were so small they were used to turn grinding stones for making flour and for carrying water. Males are called Jacks and females are called Jennys or Jennets. Their height generally averages between 30" and 34" and adults weigh in the range of 80-120 kgs. Gestation is between 11-13 months. Miniature donkeys can live for 35+ years. Donkeys love company both human and other donkeys. They are herd animals and will pine without a companion. Goats, sheep and ponies are not suitable as companions. They can easily become obese so their diet needs to be watched carefully.